Kleefeld on Comics: On Business: A Model for Nice People? 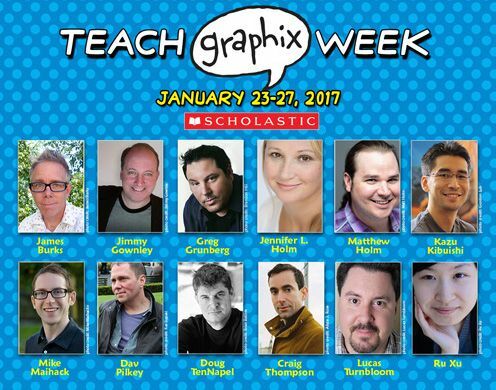 This week is Teach Grahix Week according to Scholastic, who will "offer literacy tools for teachers and librarians to bring these books alive in the classroom — including a LIVE broadcast, Skype calls with Scholastic authors, a Twitter chat, classroom teaching guides and a chance to win a Graphix library!" You can read more details over at their blog. Scholastic, as you may know, has ramped up their graphic novel production considerably the past decade or so, initially buoyed by the resounding success of Bone and, later, by anything that Raina Telgemeier did. Not to mention the popular-yet-still-rarely-reported-on Babymouse series. Add in some folks like Doug TenNapel, Craig Thompson, and Kazu Kibuishi and you've got yourself an incredible amount of talent at your disposal. Most of the creators who work with Scholastic seem to be very open and caring people. (At least as far as I can tell. I can't say I know any of them personally.) I've seen/heard most of them speak, and they seem to be generous with their time and knowledge. So I'm not surprised that Scholastic has rounded up so many of them to help out this week. I'd guess, in fact, that any of their authors NOT helping are only abstaining due to prior commitments. It makes me wonder about the specifics of Scholastic's business model. Clearly, they're interested in talented creators who work on all-ages books, but I wonder how much their individual temperaments come into play when Scholastic makes a decision to offer them a contract. Is it something where an editor says, "Yeah, they seem great and would be a joy to work with" or is that personality quality just something that comes with the territory? Like, you're already going to be a pretty nice person in general just by the nature of the types of stories you tell. Is it deliberately groomed by Scholastic or just a happy by-product? I don't know anyone AT Scholastic to be able to ask, but it's just the type of thing that I wonder about sometimes. Don't forget, if you are in education, be sure to check out details of Teach Graphix Week and sign up for some of the resources they'll be making available.